Building a distinctive inground pool & spa will make your outdoor property more attractive, functional, and enjoyable. 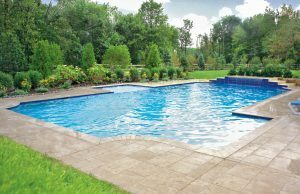 With Blue Haven as your Westchester pool contractor, we can bring your backyard goals to fruition with thoughtful design, top-flight workmanship, and state-of-the-art technology. We design and build without compromise. Every project is a custom creation that incorporates the aesthetic elements and functional features our clients select. The possibilities are diverse. Across the Hudson Valley, popular options for pool shapes range from traditional rectangles to curvy free-form silhouettes. Favorites for water features are bubbler fountains, natural stone waterfalls, and arching laminar water jets. Other trending flourishes include fire bowls, integrated planter pockets, and tanning ledges with built-in umbrellas. Beyond your inground pool & spa lie decking, landscaping, and other backyard amenities. With this in mind, our portfolio includes designing and building a variety of these additions for outdoor living. From fire pits to retaining walls, we can provide you with a unified, comprehensive plan for enhancing your outside environment. When it comes adding greenery to your exterior living area, we have you covered as well. We collaborate with our longtime professional partners at Damiano Landscaping and Johnsen Landscape. However, if you have already chosen a landscape firm, we are more than happy to coordinate with them. Our skill set also extends to the specialty trade of pool remodels. We provide top-to-bottom renovations to update existing pools & spas. 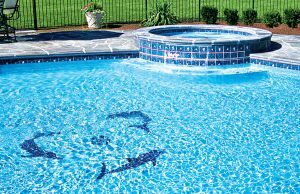 Along with updating your pool’s appearance, we modernize outdated equipment to make your pool automated, water- and energy-efficient, and virtually chlorine-free. Among custom pool builders in Westchester, it’s hard to compete with Blue Haven Pools. For starters, you can benefit from the resources of a national organization with operations serving dozens of U.S. markets, including additional New York offices in Long Island and Hudson Valley. Even better: When you hire our pool-construction team, expect personalized service with a superior level of expertise. Your project will be overseen by native New Yorker Dominick Solitario, our Hudson Valley manager. With decades of designing and building custom pools under his belt, Dominick is a true industry veteran. His lengthy work portfolio gives him deep insight from both the design and construction perspectives. He applies a sophisticated ability to integrate client requests, masterful design, backyard conditions, and real-world construction knowledge into beautiful, cohesive aquatic masterpieces. High-capacity cartridge filters with built-in Microban product protection that inhibits the growth of odor- and stain-causing mold, mildew, and bacteria. Dazzling LED lighting that bathes pools, spas, and water features in dazzling, changing colors with lower energy costs. Saltwater and ozone sanitizing systems that help ensure swimmer-friendly water without the notorious side effects of traditional chlorine. We take seriously our commitment to capturing everything you want and need in your new backyard resort. To properly prepare for taking on the challenge, we visit your home and conduct a thorough assessment of your backyard and review your preferences. We are available to provide you with a complimentary in-home consultation. Contact Blue Haven to schedule one, and let us bring your backyard vision to reality.